Riverton Wyoming: Known for Best Brushes Ever! 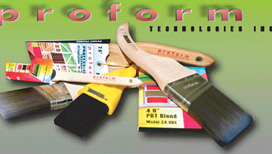 Hands down without any agrument the best paint brushes in the world are made from a company called Pro Form Technologies in Riverton Wyoming. You would not in a million years expect that a company that manufacturer professional painting brushes is based in Wyoming. Making some of the most comfortable brushes on the market. All of there handles are extremely comfortable! They even make ergonomic brushes. Making the Picasso! (click on Picasso to learn more) This is by far the best detail brush ever! You have to read the article on this site to truly appreciate this brush. ACID TIPPED BRISTLES. Yes its in caps! Get your hands on an acid tipped brush and you will never go back. Standing behind their product. They have a small hands on business feel. Send the company an email and you will probably get an email back from the president. We did. But please don't try it just to try it. They need to focus on making brushes. One of the reasons that they may still have that home town feel is because the company is located in a county of only 10K people. These folks still take pride in their work! Here is whats even more surprising... this town just got its first Sherwin Williams store. The store will be open normal hours and is about 6k sq ft. This Sherwin Williams has a typical layout with wall coverings, sundries, paint and other typical paint products. So in the past if you lived in Riverton you needed to buy professional rated paint you had to drive to Casper WY. Most of you may not know where Casper is but its trek for paint. It is just mind blowing hat the employees at Pro Form Technologies didn't even have a paint store and still produce some of the best paint brushes you have ever used in your life. Its almost like they were born to do what they do best... make the best paint brushes money can buy! Thank you for your commitment to quality and keep up the great work! These are some of the best paint brushes I have ever used. The new bristles flow the paint better and give one the ability tocut in quicker and with fewer mistakes, speeding up production time. Keep up the good work!